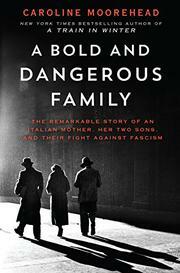 A history of the Italian family who mounted an intrepid campaign against Mussolini. After World War I, fascism took hold in war-torn Italy, culminating in the rise of 39-year-old Mussolini as the nation’s youngest prime minister. In 1922, supported by the royal family, the Vatican, and about 25,000 well-trained Blackshirts, Mussolini, demanding “full powers” to lead, faced weak opposition by socialists, communists, and liberals. In an absorbing, well-documented narrative, historian Moorehead (Village of Secrets: Defying the Nazis in Vichy France, 2014, etc.) focuses on the Rosselli family—brothers Carlo and Nello and their mother, Amelia—who became tireless leaders of an anti-fascist movement that grew in strength as Mussolini’s reign of terror intensified. “Fascism,” writes the author, “quickly spread its tentacles over the fabric of Italian life. The army, the aristocracy, the Church and industry, all were rallying to defend the rights of a usurper.” Drawing on thousands of family letters as well as biographies of Mussolini and histories of the period, Moorehead powerfully depicts the family’s anger and despair as Italy succumbed to what Carlo called “an enormous black plague.” Although at first some anti-fascists hoped that Mussolini, who was “boastful, vain, cruel and erratic,” would fail on his own, it soon became clear that they needed to wage a real battle. By 1927, Mussolini had abolished elections and installed himself as minister “of foreign affairs, of the interior, of war, of the navy and air force, and of corporations.” Textbooks were rewritten and journalists fired if they showed “aversion” to fascism. Anti-fascists grew stronger, with Carlo standing as “the most prominent leader of the non-communist anti-fascist opposition.” The author chronicles the efforts by Carlo and Nello that led to repeated arrests and incarcerations on Italy’s prison islands. When he was released, Carlo took up a frantic pace of writing and speeches, traveling to Paris, London, and, during the Spanish Civil War, Spain. Constantly in Mussolini’s cross hairs, the brothers finally were assassinated: 200,000 people followed their funeral procession. A vivid portrait of resistance in dark, perilous times that is not without contemporary relevance.